Ever since I got this darn disease, I’ve been surrounded by people who want me to be careful, take it easy, look after myself, rest. I appreciate their looking out for me, and my friends have graciously supported me and saved me from errors, but it’s the general run of noise from strangers that makes me want to gnash my teeth. You parents know what I’m talking about. One hint of a baby lump and immediately everyone on the planet knows how better to manage your life, your pregnancy, your parenting, heck, even your breathing. 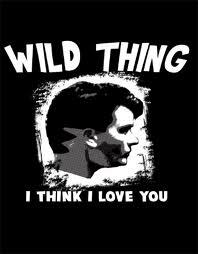 But inside me, there’s a wild thing trying to get out. Occasionally I do silly things, like put in offers on cottages I well know I would be unable to maintain or afford. Other times I throw myself at projects and such and it all works out okay, even though it doesn’t look like a good thing at the start. I can never predict how things will go. But if I stop throwing myself at these things (and throwing IS the operative word), I start to lose what makes me, me. A certain insouciance, a devil-may-care attitude, a cheerfulness, a bizarre sense of optimism. I think a lot of writers share this mind-set – else how could we sit down day after day in a world filled with arguably excellent books and try to put our words together in some sort of way that says something different from what has already been said, a thousand times before? It’s a madness. It takes wilful blindness to the foolishness of our quest. It takes our wild thing to come out and play. And who’s to say we won’t write something brilliant and utterly inescapably an addition to the literary canon? Or maybe write an adventure that takes someone out of their nine-to-five lives for a moment and lifts their souls. Or thrills them and sets them off in a new direction? Or frightens the bejesus out of them? Well, all those nay-sayers will say those things. They’ll tell us to do something else, rest, give up. “Why do you need to write?” they ask.